As a Northwestern Mutual Representative, in all situations I will make those recommendations which I would do for myself and my family if faced with a similar situation. By matching your needs with innovative solutions utilizing world-class insurance services and internationally recognized investment products, I will do my best to help you protect and provide for those people you care about most. I will work hard to build a relationship with you based on trust and integrity, always striving to provide you with the same level of ethical service that I would expect for myself. 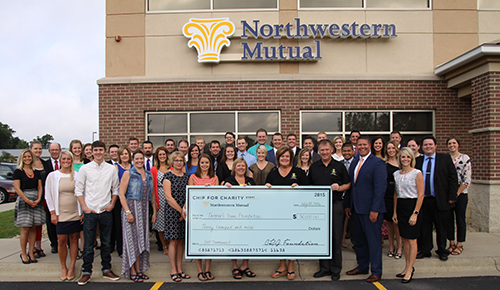 AUGUST 2017 – Northwestern Mutual-Saint Cloud donated $40,000 at their 4th annual “Chip for Charity” golf tournament in support of the Nicholas P. Koenig H.E.R.O. Foundation and Alex’s Lemonade Stand Foundation. The tournament was held June 5, 2017 at the Wapicada Golf Club in Sauk Rapids, Minnesota. Businesses and community members from around the St. Cloud area took part in the event to support local families dealing with the effects of pediatric cancer. The Nicholas P. Koenig H.E.R.O. Foundation helps families in many ways: through financial grants, scholarships to 4th year medical students at the University of Minnesota pursuing pediatric oncology, and by supporting children receiving treatment by adopting a room at University of Minnesota Masonic Children’s Hospital in their son, Nicholas’s, honor. Alex’s Lemonade Stand Foundation is a national childhood cancer foundation dedicated to raising funds for research into new treatments and cures for all children battling cancer. Since the golf tournament’s inception in 2014, $100,000 has been raised by the 30 members of the Saint Cloud office for organizations that focus on families effected by pediatric cancer and cancer research. “It is our goal to support our communities and do our part to come alongside families affected by this terrible disease and work to eradicate the source,” states local Managing Director, Josh Longnecker. To get involved and learn more please visit: npkherofoundation.org and alexslemonade.org. 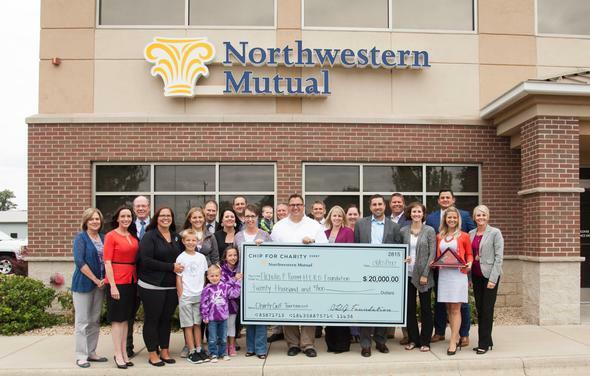 SAINT CLOUD - July 20, 2016 – Northwestern Mutual donated $30,000 at their 3rd annual “Chip for Charity” golf tournament in support of Tanner’s Team Foundation. The Tournament was held June 6, 2016 at the Wapicada Golf Club in Sauk Rapids, Minn.
115 members from the St. Cloud community took part in the event to support local families by helping to cover housing, transportation, and household expenses during a child’s treatment and care. “As a father myself, it’s comforting to know that there’s organizations like Tanner’s Team to take away the financial burden and keep families focused on what matters most during these difficult times.” says Joshua Longnecker, Managing Director. Since the tournament’s inception in 2014, more than $70,000 has been raised by the Saint Cloud office for organizations that focus on pediatric medical needs. “We will never stop working to impact our communities and the families that we live and work with.” says Longnecker. Tanner’s Team Foundation financially helps families in central Minnesota with children fighting a life-threatening illness or serious injury. To learn more about Tanner’s Team Foundation visit www.tannersteam.org. Josh Longnecker was recently featured in the St. Cloud Times, discussing the importance of financial planning for young homebuyers and getting started early. Click here to read the article.